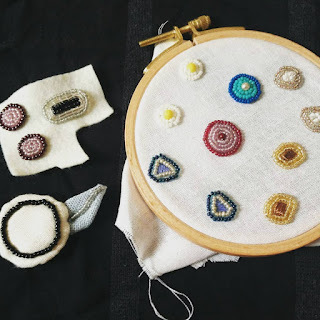 I enjoy hand embroidery every morning. My daughter and son wake up very early in the morning and I have time to enjoy stitching. A few days ago, I made an asparagus and a flower with beads. One of my friends liked the asparagus and I made more for her. 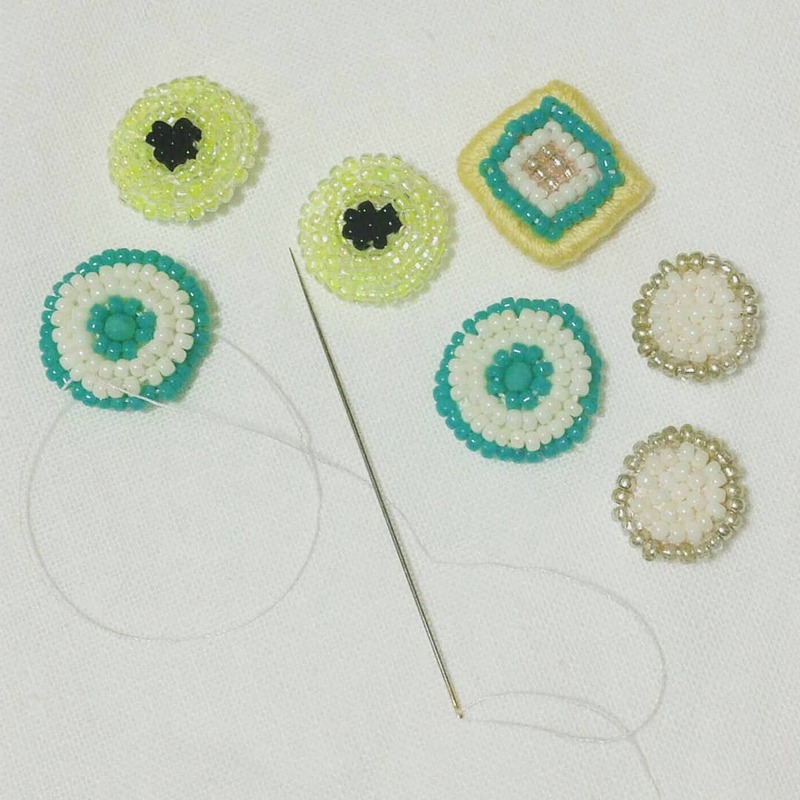 I'll put pins on the back of them and make asparagus brooches. Then, I made other Kogin embroidery item. Could you see what they are? They are pill bugs, my son loves them. These are my favorite items. The kindergarten of my son has begun and I'm stitching a lot everyday. I made a beaded dandelion brooch because he is in the class named dandelion. 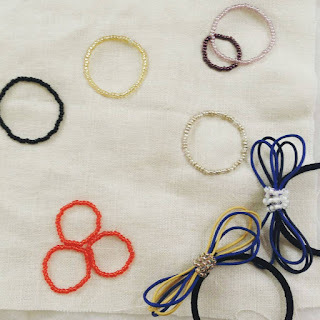 While he was there, I made lots of Kogin embroidery accessories. I'll sell them at an art event with friends. I'm so happy to have my own time , even though 1-2 hours a day. I found a very good tool for embroidery. These days, I'm training to embroidery on fine linen fabric. Because of the difficulty of counting, the results are not so good. But finally, I found a good tool in my daughter's toy box. It's a light box to trace something. She got it for drawing Manga. I can count linen easily on it. Even on black or deep blue color, the light helps me to count it. Now I can embroidery faster than before, and the result is more neat! The other side is also beautiful. I love both sides. Which one do you like better? 5 weeks after her injury, My daughter is better now and she could dance (hula) with her team today. made bow hair pins as small gifts. My son is doing well too. And he likes making something with me. These days he makes lots of Sushi rolls of origami papers. He makes them so often, and finally I made them by Kogin embroidery. I stitch everyday and made many embroidery goods. And now I'm trying to stitch on fine linen fabrics. But it's hard for me to count the linen. I'm stitching everyday and want to do better! 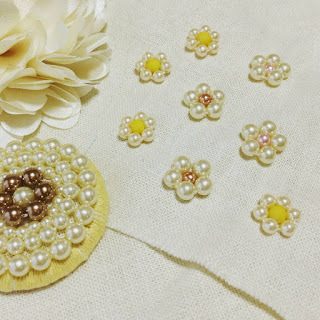 These are what I practiced on brown and yellow linen. It was too hard for me to count the brown one. 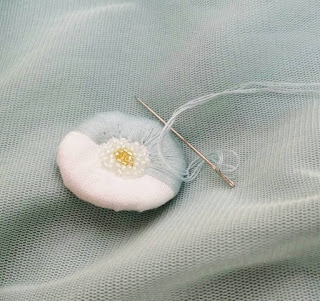 If you could stitch well on linen, please teach me how you practiced.